Time travel: singly responsible for some of the biggest noodle-scratchers on film. Looper gets the topic out of the way in one 30-second conversation between Bruce Willis (Joe) and Joseph Gordon-Levitt (erm…also Joe…we’ll get to that…), in a scene in a coffee shop which recalls the tension of a similar sequence in Heat. Willis quickly puts a stop to Levitt’s pondering about changing his – and therefore Willis’ own – future, dismissing the idea as a waste of time. This exchange sums up Looper in that it is an action film, a sci-fi film, and even a love story, but it doesn’t fall into the trappings or self-indulgence of any of the three. Instead the film moves at a pace, with only an intermittent voice-over to explain a few choice pieces of terminology. According to the film, time travel is invented some time in the 2070s, and is immediately out-lawed. With movement restrictions and 24/7 surveillance at their peak, an easy nod to the present’s increasing ‘Big Brother’ culture, there is no way to dispose of a body in 2072, so organised crime decides to send their victims back in time to be taken out, meaning they never existed. 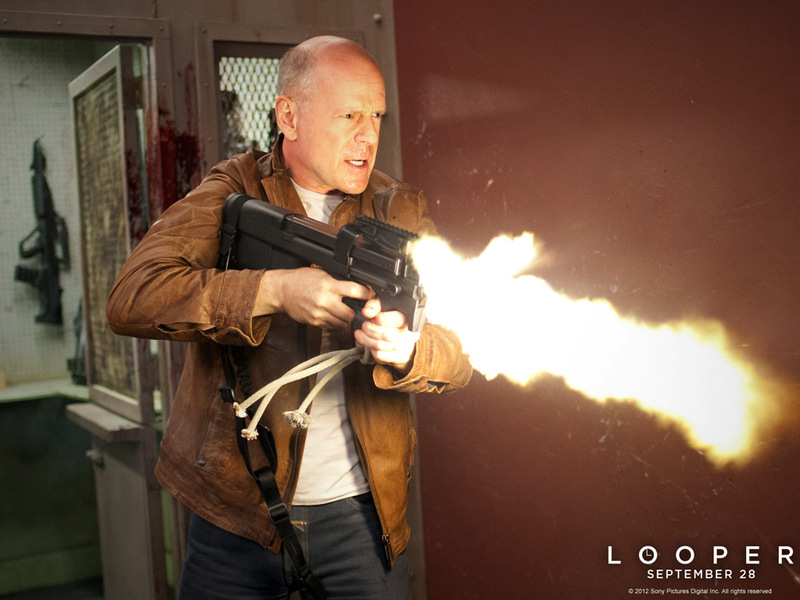 Joe is a ‘looper’, a hit-man who takes out these time-travelled targets for bars of silver with a trusty blunderbus. If the whole thing sounds like piracy, then it is. This is sci-fi piracy in the most tightly controlled and regulated way possible. The looper is given a specific time to be ready and waiting and the target appears in front of them, hands tied and face covered. Both Willis and Levitt are the same character, 30 years apart, and as a result the character arc is immediately both interesting and confusing. The story begins with young Joe carrying out his day job with precision, this is a guy at the top of his game – think a more talkative Ryan Gosling in Drive – and as always, everything seems to be going well. Of course, it doesn’t last, and the audience is treated to a massive helping of foreboding when one of Joe’s friends fails to complete the final task of any looper – ‘closing their loop’. As you can imagine, running a serious crime operation 30 years in the past leaves a lot of loose ends, so when your time as a looper is up they find your 30 years-older self and send them back as your final hit, leaving you to have relaxed three decades of retirement. Knowing that Bruce Willis is in the film, it’s fairly obvious what happens next, and often this film doesn’t push the envelope enough in terms of story, but the chase movie we are presented with does succeed on being more than meets the eye. Levitt is a triumph at being a younger, cockier Joe compared to Willis’ usual gruff old man, and the interplay between the pair is fun to watch – it’s almost a shame that they don’t spend more screen time together. 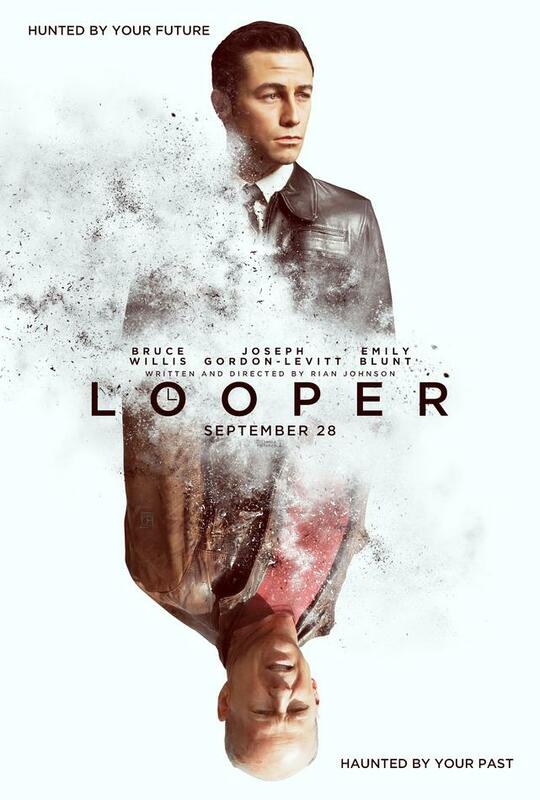 The wider world of Looper pokes its head in now and again with a few subtle touches such as solar panels clumsily bolted onto every car and families living in an abandoned school bus, painting a picture of a world where the loopers’ type of killing could easily fit in unnoticed. Emily Blunt is the only female part, save blink-and-you’ll-miss-it appearances from Piper Perabo and (Summer) Qing Xu, and surprisingly manages to give depth to Sara, who is, on paper, just a single mother who lives on a farm. Unfortunately the obligatory lovey-dovey scene forces the character to take a step back toward cliché territory. It’s Sara’s ten-year-old son Cid (Pierce Gagnon) who really steals the show though, delivering matter-of-fact lines with conviction rarely seen (even in many adult actors), but with the inherent charm of a child. 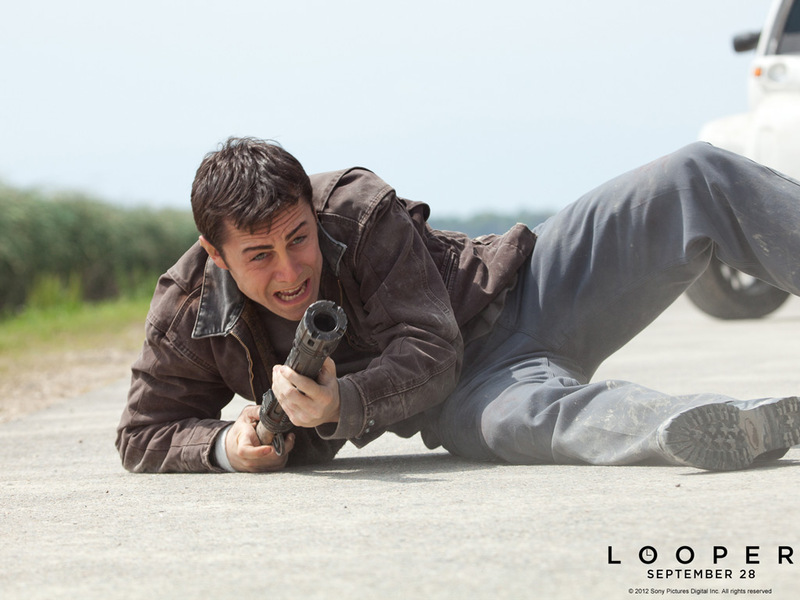 Looper is a film riding on a wave of hype, and at times it struggles to keep up with itself, but largely it delivers on what it promises. With any film which has multiple actors playing one role, the chemistry and natural delivery of the stars is key, and luckily Levitt and Willis have the skills to make the concept convince. Though there have been some ‘touch-ups’ to Levitt to make him look more like Willis, it’s the performance which really convinces, and cements the idea in the audiences’ mind before Willis even appears on screen. In the world of time-travel films, Looper sits comfortably alongside Willis’ own Twelve Monkeys as an example of how to do it well. A few snags prevent the film from achieving its fullest potential, but it does give far more than you might expect at first glance, and the performances quickly hook you in until the credits roll. Variety can divide people. 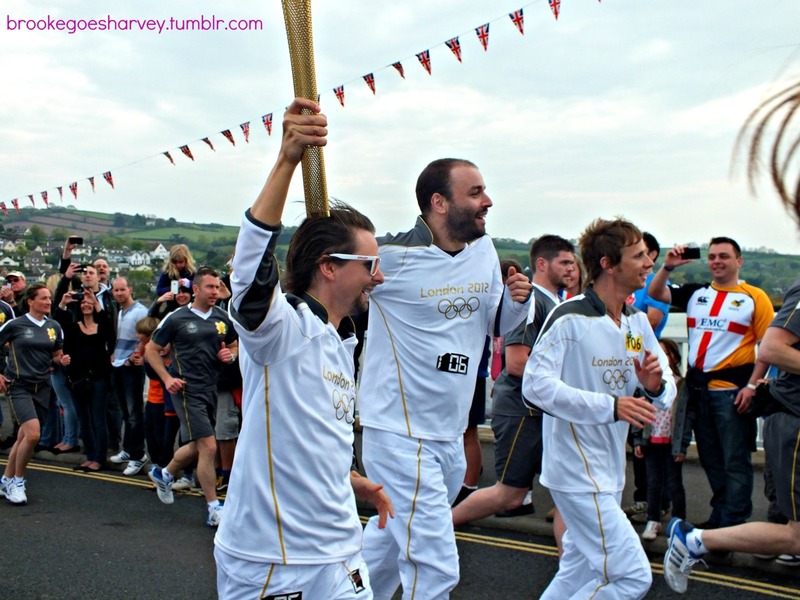 For almost 20 years Muse have been steadily growing in popularity, culminating this summer by being asked to contribute the official song for the London 2012 Olympic and Paralympic games, not to mention selling out the London O2 Arena. In what could well be the height of their career, you might expect the band to play it safe and give chart-lovers what they want to continue their ascent into legendary status. 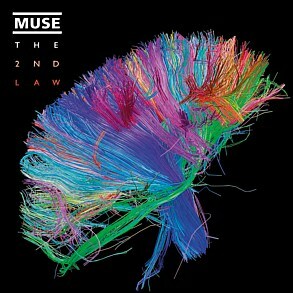 The 2nd Law however, is not afraid to buck the trend and give fans something different to what they’ve heard before. From the outset the album is unmistakeably Muse, with the signature crunchy guitar and operatic vocals introducing opener ‘Supremacy’. All the things fans have come to know and love about the band are present and correct, including the slightly hypnotic vocal style of leading man Matt Bellamy, in a tune which wouldn’t sound out of place as a theme song for a new James Bond film. Almost immediately though, the band shake things up with second single ‘Madness’ a track stripped bare and back-to-basics, it could just as easily have been an acoustic number. ‘Panic Station’ takes a completely different tack altogether, sounding like a lost gem from the early years of Red Hot Chili Peppers. Throughout the album the band continue to change things up with every track, making an eclectic mix which just barely hangs together as one album. In interviews the boys have said they wanted to write songs for this album which couldn’t have appeared on any other Muse album – and they have undoubtedly succeeded. The influences shown with previous effort The Resistance have moved on again this time around. There are clear elements of Queen in ‘Madness’ and ‘Survival’, but that couldn’t be further from the likes of album tease ‘Unsustainable’, which has a glimmer of dubstep akin to the likes of Skrillex. In many ways the Muse DNA shown in their previous album has been pushed to its limits here, reflected in the contrast between the geometric technicolour of its cover art, to that of The 2nd Law, which is a mass of sprawling strands of colour, almost fighting to escape. If it’s ‘normal’ Muse songs you are looking for, then there is still something here for you to enjoy. ‘Big Freeze’, ‘Animals’ and ‘Follow Me’ all stick closest to the ‘traditional’ formula, but still each offer something new. The band’s knack for a deceptive slow number continues with ‘Explorers’, which seems to be the spiritual successor to tracks such as ‘Invincible’, ‘Guiding Light’ and even ‘Sing for Absolution’. The real unexpected pleasure on the disc is the much-discussed debut of songs penned by bassist Chris Wolstenholme: ‘Save Me’ and ‘Liquid State’. As well as writing, Chris also takes lead vocal duty, and the songs really give a completely different vibe to not only the rest of the album, but the entirety of Muse’s back catalogue. Luckily both tracks are a triumph. Chris’ voice is similar to Francis Healy from soft pop-rock outfit Travis, and the effect of combining it with Muse’s style is excellent. ‘Save Me’ is a calmly flowing plea for help, while ‘Liquid State’ is more familiar waters musically, but has a refreshing tone to it. The most enjoyable part of the songs is that Matt remains almost completely silent and lets Chris steal the show, no easy task for a musician with such distinctive talent – though since he still remains timid at live shows he may well have enjoyed sinking into the background. This album is not out to prove anything to anyone but the band itself. It takes a while to get used to and doesn’t necessarily give the first impression you might expect, but it rewards perseverance in a way no other album in Muse’s back catalogue does.